Populism is not new. Waves of populism spread through Russia and the US at the end of the 19th century and through several European and Latin American countries in the 20th century. In these latter episodes, populism remained marginal in Europe and became influential in some Latin American countries. What is peculiar in the recent wave is that populism has spread and become influential in some countries with well-established liberal democracies. This begs the question of how populism can not only co-exist but even thrive in liberal democracies. In line with a common view in political science, we use the definition of populism as “an ideology that considers society ultimately separated into two homogeneous and antagonist groups, the ‘pure people’ versus the ‘corrupt elite’” (Mudde 2004). Populist leaders claim to have a monopoly on the political representation of the people. This monopoly on representing the ‘people’ is almost a moral right which delegitimises all other parties, associations, and groups. This view is in contrast with the concept of liberal democracy. Liberal democracies are political systems based on pluralism where different groups represent different interests and values, which are all legitimate provided they respect the rules. Associations play a key role in liberal democracies. Alexis de Tocqueville in his Democracy in America (1835) writes on the role of associations (defined also as ‘intermediate bodies’, i.e. spontaneous groupings not organised by the state) in democracies. But what is the role of associations if the populist leaders are the only legitimate representative of the people? Are individuals who belong to associations more prone to voting for populist parties? In a recent paper, we bring this question to the data (Boeri et al. 2018a). We test whether belonging to a body in civil society (as proxied by belonging to a civil society association) reduces the probability of voting (as stated in retrospective questions) for a populist party. 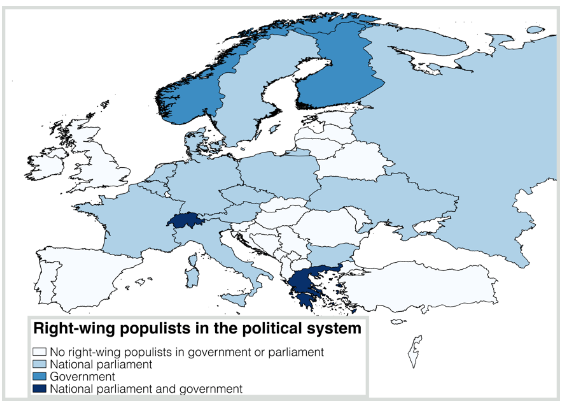 We use several waves of the European Social Survey (ESS), which comprises more than 110,000 individual observations, covering 18 European countries with populist parties for about 15 years. To identify voting for populist parties in Europe and Latin America, we follow Inglehart and Norris (2016), who classify populist parties based on the 2014 Chapel Hill Expert Survey (CHES). In our regressions we control for country and time effects (and their interactions) as well as for several individual characteristics, including gender, age, education, and income. We find strong (and statistically highly significant) evidence that individuals who belong to associations are less likely to vote for populist parties. The result holds also across all waves. The coefficient on civil association is about 3%. This is a high number considering that the average vote share for populist parties is between 10% and 15% in most countries. In conclusion, membership of civil society reduces the vote for populist parties by 20% to 30%. Source: Boeri et al. (2018b). So, what is the role of civil society? When we split the samples into 2002-10 and 2012-16, the coefficient on civil association membership is negative and statistically significant for every year but becomes even more negative after the financial crisis. Note also that the coefficient of the variable for (self-reported) insufficient income is negative and significant after the financial crisis, and its magnitude increases 2-3 times in the post-crisis period. What can explain the increasing negative correlation between civil association membership and populist vote? One potential explanation is that before the crisis, party affiliations were relatively strong and ideological voting behaviour played an important role. 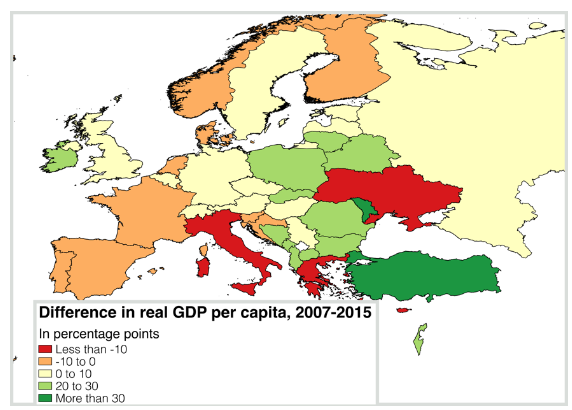 Post-crisis – notably, with the diminished role of social-democratic parties across Europe – individual beliefs often shifted, with many disconnecting from traditional parties. As a result, many people felt open to vote for new parties. Civil associations, on the other hand, provided ideological ‘anchors’ and alternative spaces where ‘outsiders’ could voice their opinions. Another complementary explanation is that economic crises affect the system of beliefs in the role of the state (Giuliano and Spilimbergo 2013). People, mostly young people, demand more from the state but, at the same time, are more sceptical about it. This unanswered demand is fulfilled by civil society associations and less by populist voting. OLS and Probit regressions have the potential problem of self-selection, given voters may decide not to vote (Guiso et al. 2017.) Following the literature, we estimate a two-step Heckman model. In the first stage, we estimate the probability of participation. We assume that lack of awareness affects voter turnout by increasing the cost of acquiring information about political platforms and candidates, but does not directly impact choice of political party. Overall, the results from estimating the two-step Heckman model support our main finding. Civil society has long been recognised as a key defence of liberal democracy, as Alexis de Tocqueville wrote almost two centuries ago. At the same time, populists may pragmatically use associations as transmission belts, as historical experience in some Latin American countries may indicate. So, is civil society an enemy or friend of populism? We show that de Tocqueville was right. In particular, we find that in Europe individuals belonging to associations are less prone to voting for populist parties. Qualitatively similar results hold for most Latin American countries. Finally, our findings also shed new light on the role of the global financial crisis in the political process. The crisis has not simply caused a populist wave (Boeri et al., 2018); rather, it may have changed (and enhanced) the role of civil society. In a world where political systems, institutions, and ideologies are increasingly questioned, civil society assumes a new role. Authors’ note: The views expressed in this study are the sole responsibility of the authors and should not be attributed to the IMF, its Executive Board, or its Management. Boeri, B, Prachi Mishra, C Papageorgiou and A Spilimbergo (2018a), ““Populism and Civil Society”, CEPR Discussion Paper 13306. Boeri, B, Prachi Mishra, C Papageorgiou and A Spilimbergo (2018b), “A Dialogue between a Populist and an Economist”, AER Papers & Proceedings 108: 191–95. de Tocqueville, A (1835), Democracy in America (edited and translated by H C Mansfield and D Winthrop), University of Chicago Press. Giuliano, P and A Spilimbergo (2014), “Macro Shocks and Beliefs”, Review of Economic Studies 81(2): 787-817. Guiso, L, H Herrea, M Morelli and T Sonno (2017), “Demand and Supply of Populism”, EIEF Working Paper 17/03. Inglehart, C and P Norris (2016), “Trump, Brexit, and the Rise of Populism: Economic Have-Nots and Cultural Backlash”, HKS Working Paper No. RWP16-026. Mudde, C (2004), “The Populist Zeitgeist”, Government and Opposition 39: 541-63.